Get the latest updates on ACCME best practices to stay compliant! Other ACCME requirements and best practices! 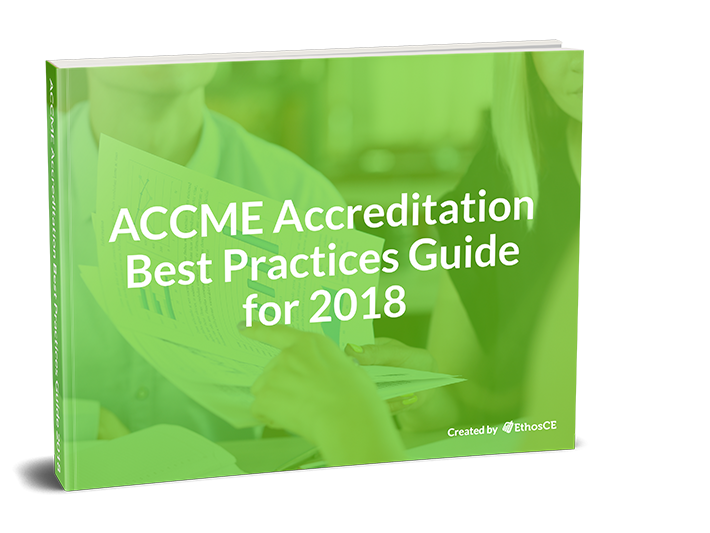 Maintaining ACCME accreditation is the most important challenge that your association’s, health system’s, or academic institution’s CME will confront. A loss of accreditation can undermine the value of your CME program in the eyes of your members, and your efforts to regain your status might be complicated by a change in standards mandated by ACCME for future cohorts. We’ve prepared this guide to help you gauge and strengthen your CME program’s compliance. We’ll walk you through the characteristics that ACCME looks for in determining which programs are ready for accreditation renewal. We’ll also show you how to highlight your association’s, health system’s, or academic institution’s unique qualifications to deliv- er a superior CME experience as you enter the application process. EthosCE has more than 16 years of experience partnering with medical associations, health systems, and academic institutions in the support of CME programming compliance. Read on for an overview of the reaccreditation process and several strategies to strengthen your application.